It’s that time of year again when we release the findings of our annual content marketing survey. Over the years, we’ve talked a lot about effectiveness. But this year, while our team was discussing new questions for the survey, we stepped back and wondered – how many companies even know what effectiveness looks like? The answer may (or may not) surprise you. Get this: 55% of business-to-business (B2B) marketers said that it is unclear within their organization what an effective or successful content marketing program looks like. Regardless, what’s great about the research is that we can examine how the most-effective marketers are going about their business so we can learn from them. 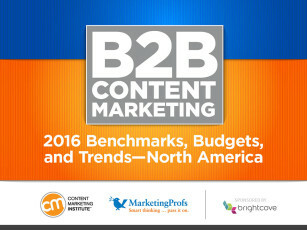 Let’s take a look at some of the key findings from the report, B2B Content Marketing 2016: Benchmarks, Budgets, and Trends – North America, produced by Content Marketing Institute and MarketingProfs, and sponsored by Brightcove. Last year, 38% of B2B marketers said they were effective at content marketing vs. 30% this year. While perhaps the industry is approaching a trough of disillusionment (which isn’t necessarily a surprising or bad thing – and was something I mentioned in my opening address at Content Marketing World 2015), companies that report being clear on what success or effectiveness looks like also show a higher effectiveness rate (55%). Learn more about what success looks like in today’s organizations in our B2B research roundtable discussion on the topic. 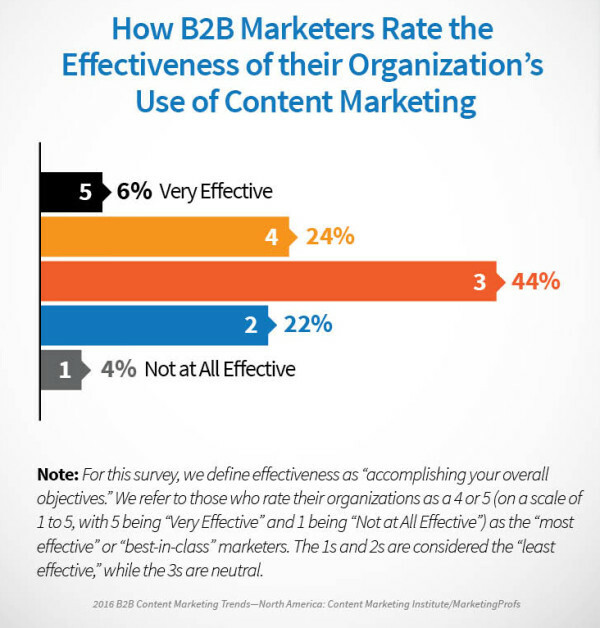 Effectiveness also increases as the organization’s content marketing grows in maturity. 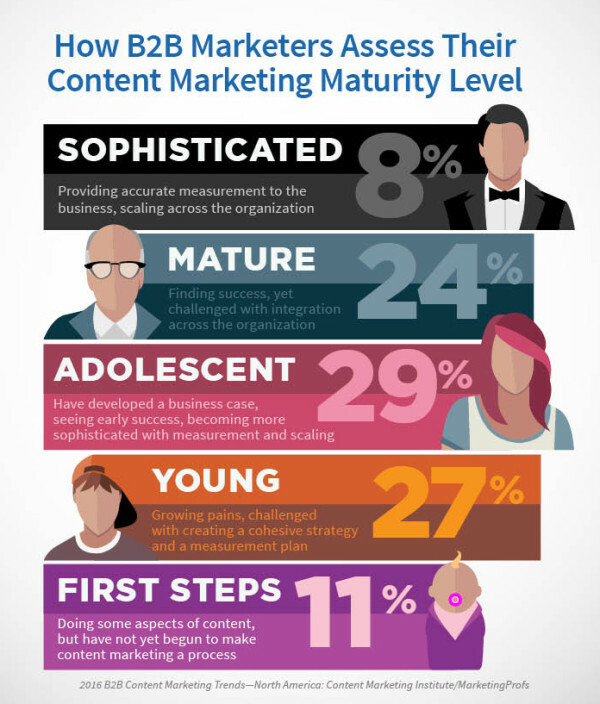 Sixty-four percent in the sophisticated/mature phase say they are effective at content marketing, 23% in the adolescent phase say they are effective at content marketing, and 6% in the young/first-steps phase say they are effective at content marketing. Stay tuned for upcoming blog posts so you can understand what more-experienced content marketers are doing. The most-effective marketers are more likely than less-effective marketers to document their content marketing strategy, have a documented editorial mission statement, and hold regular meetings. 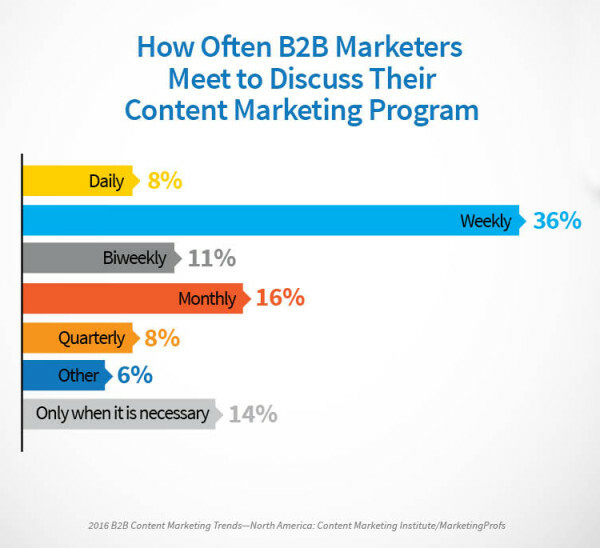 In fact, 61% of the most-effective B2B marketers meet daily or weekly with their content marketing team either virtually or in person. Furthermore, those who meet daily or weekly find the meetings to be more valuable (70%) than those who meet biweekly or monthly (49%). For the last two years we’ve shown the positive impact that documenting the content marketing strategy has on a marketer’s overall effectiveness. But B2B marketers have made less progress in this area over the last year. 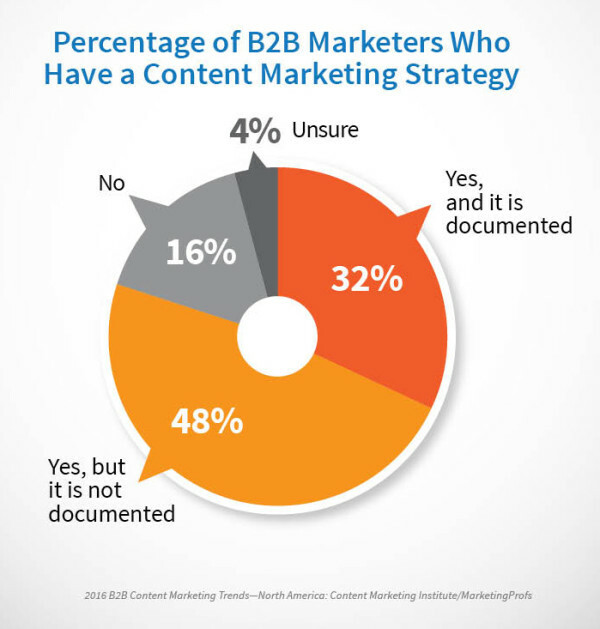 As our fifth annual study (B2B Content Marketing 2015 Benchmarks, Budgets, and Trends – North America) revealed, 35% of B2B marketers had a documented content marketing strategy, compared with 32% this year. Which tactics, social media platforms, and paid methods of content promotion are marketers using? Which are the most effective? What is the most important metric for measuring content marketing success? How much budget do they allocate to content marketing? Which content offers are they asking people to subscribe to? Which goals will they be focusing on over the next 12 months? What the top priorities are for B2B content creators in the coming year — and which ones are falling out of favor? What do you think of the findings? What does effective or successful content marketing look like in your organization? Let us know in the comments.